Would you like to be more directly connected to a specific, important ministry in Africa? Consider joining “Friends of Cidel,” an organization that supports and follows the work of Dr. Augustin Hibaile. Dr. Hibaile was born into a Christian family of four children in the northwestern section of the Central African Republic. At the age of 11 he accepted Jesus as his personal Savior. Shortly thereafter, he committed his life to serve Jesus. Following high school, he attended the Biblical Brethren Theological Seminary at Bata (in central C.A.R.) and then went on to earn his Doctor of Ministry at Grace Theological Seminary, located in Winona Lake, Indiana. Dr. Hibaile is married to Marie Helene. They have been blessed with eight biological children (four boys; four girls – ages 26 to 6 years old) and three adopted orphans who are relatives. Four of his children are at the university level, two in high schools and two in elementary schools. 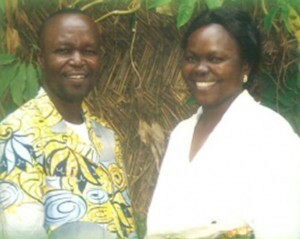 His wife Marie Helene is a graduate from the Bata Bible Institute. She is currently the National President of the Women of the Good News. She is involved in the ministry of True Love Waits and True Love Stays which are sponsored by a Community Development Organization.